There is a cluster of mountains on New Zealand’s North Island called the Kaimanawa Range. These dusty mountains hold a rare treasure, particularly for the South Pacific: Horses. Horses are not indigenous to the islands of Oceania, but they seem to like it there! That means they were brought there, relatively recently, by European colonists and missionaries. Unfamiliar with the terrain, many foreigners brought horses with them that later became part of the wild fauna. The first horses were brought to New Zealand in 1814 from England. They were brought to work on farms and provide transportation for the growing colonial population. By 1876, the population of wild horses on the North Island was growing too! Today, the Kaimanawa wild horses are protected by the New Zealand government. Their habitat and numbers are closely guarded to ensure their survival amidst land and resource development. Horses were introduced to Vanuatu a little later, also by an Englishman. In 1845, James Paddon brought a number of horses to the island of Tanna to work on copra plantations. Since the decline of the industry and a general return to traditional culture on the island, the horses have lived relatively wild. They can still be seen wandering the grassy slopes of White Plains. 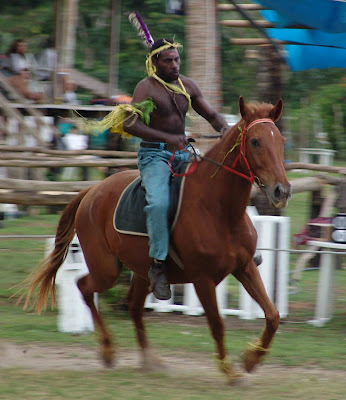 Some ni-Vanuatu have learned to befriend and train the horses, but only for limited transportation and tourism purposes (as you see in the photo here). For the most part, the horses remain wild — and are respected for it! A final word of warning, friends. There might be a reason that horses never originally lived in the South Pacific. It is hot and humid, and not the best environment for horses to be domesticated. Many travelers have noted that horses in Rarotonga, Cook Islands are not kept very well by their owners. The horses are not very happy, and not well-behaved either. Having a leather saddle strapped to your back in the sweltering sun is not very comfortable, you can imagine! If you’re interested in visiting the horses of the South Pacific, the best way to do it is from a distance! Riding a horse may sound like a thrilling time. But I promise you that it doesn’t compare to standing on a hill and watching a herd of wild horses gallop off towards the horizon. Beautiful!